The 30-share index rebounded by 289.28 points, or 0.74 per cent, to quote at 38,934.35. The NSE Nifty also went past 10,700 rising 71.30 points, or 0.61 per cent, to 11,751.80. 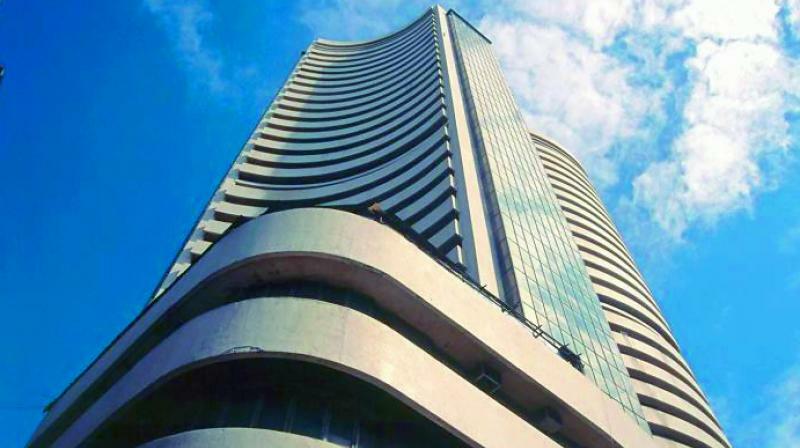 Mumbai: The BSE Sensex rallied nearly 300 points in early session Monday on fresh buying in IT, teck and capital goods counters following robust GDP growth rate for the April-June quarter of fiscal and recovery in rupee. The 30-share index rebounded by 289.28 points, or 0.74 per cent, to quote at 38,934.35. The benchmark bourse, however, pared some gains within the first hour of the session, and was trading 153.03 points, or 0.40 per cent, higher at 38,798.10 at 1000 hrs. The gauge had lost 251.56 points in the past three sessions. The NSE Nifty also went past 10,700 rising 71.30 points, or 0.61 per cent, to 11,751.80. Official data released after market hours Friday showed India's economy grew at two-year high of 8.2 per cent in the April-June quarter of 2018-19 on strong performance of manufacturing and agriculture sectors, increasing its lead over China to remain the world's fastest growing major economy. The rupee's recovery from its record low against the dollar and fresh buying by domestic institutional investors also fuelled the uptrend in the market, brokers said. However, weak Asian cues capped the gains, they added. Heavy buying was seen in IT, teck, capital goods, consumer durables, healthcare, power, auto, metal and PSU indices on BSE, rising up to 0.91 per cent. Auto stocks were in demand after the release of sales data for August on Saturday. Wipro stock was the top gainer in the Sensex pack, by surging 6 per cent, after the IT services major on Sunday said it has won an over USD 1.5 billion engagement from Alight Solutions LLC, its biggest deal till date. Other gainers included Sun Pharma, Tata Motors, PowerGrid, Asian Paints, Coal India, Bajaj Auto, L&T, Infosys, SBI, TCS, ITC, M&M, HDFC Bank, Vedanta, Yes Bank, Hero MotoCorp, Tata Steel, Adani Ports and Bharti Airtel, climbing up to 2.06 per cent. However, shares of the country's largest private lender ICICI Bank fell 1.24 per cent followed by Maruti Suzuki, Axis Bank, HUL and RIL, falling up to 1 per cent. Domestic institutional investors (DIIs) bought shares worth a net of Rs 171.92 crore, while foreign portfolio investors (FPIs) sold shares worth a net of Rs 212.81 crore on Friday, provisional data showed. Weak trend in Asian bourses was witnessed on worries about further escalation of the US and China trade war. Hong Kong's Hang Seng was down 0.28 per cent, Japan's Nikkei fell 0.21 per cent, while Shanghai Composite index shed 0.32 per cent in early trade today. The US Dow Jones Industrial Average ended 0.09 per cent lower on Friday's trade.